Use the map below the photo gallery to discover tennis points of interest in Brisbane. View photos from the places of interest on Brisbane's Tennis Trail in the slideshow below. Alternatively, view the photos in the 'Brisbane's Tennis Trail' album in Council's Flickr account. Select an icon to find the key places of interest. As an alternative to the online map, view the table below the map for this information. For convenience, the table is sorted alphabetically by suburb. View photos of points of interest along the trail. Ashgrove off Tennis Avenue, Corner of Park Avenue and Tennis Avenue, Ashgrove Mal Anderson park bench Mal Anderson was honoured with a park bench after a long and successful tennis career, which included an unseeded USA Grand Slam win. He was part of the only all Queensland mixed pair Grand Slam win, with Fay Muller, at the Australian Championship. He was a Davis Cup player and part of the winning team 1957 and 1973. Mal coached around Queensland and also operated a tennis complex at the Grange where he trained thousands of local children. Bracken Ridge 47 Enbrook Street Wendy Turnbull Park Wendy Turnbull Park is named in honour of the local great, Wendy Turnbull, who attended school in the neighbouring suburb of Sandgate. The park is a pleasant place to relax with views of the local area. The park features playground equipment for children. Brisbane City 1 Parkland Boulevard Ashley Cooper and Rod Laver plaques, Queensland Greats Wall, Roma Street Parkland Ashley Cooper AO (Officer of the Order of Australia) was awarded a Queensland Great Award in 2007 as winner of eight Grand Slam titles and outstanding success on the international tennis circuit. Cooper was also recognised for his significant contribution to the development of tennis in Queensland and in particular youth mentorship. See the plaque on the Queensland Greats Wall at Roma Street Parkland. Rod Laver MBE (Member of the Order of the British Empire) is an international sporting star who left school at 15 years of age to pursue a career in tennis. His maiden international win came during his first trip abroad in 1956 when he won the US Junior Championship at 17. Rod's career boasts 20 major titles in singles, doubles and mixed doubles. Rod turned professional in 1962 and during a 23-year career that spanned the amateur and open eras, he won 47 professional titles in singles and was runner-up 21 times. Rod has been inducted into the International Tennis Hall of Fame and the Sports Australia Hall of Fame. He was recognised in 2005 as a Queensland great. Brookfield 512 Brookfield Road The Old Milton Ticket Box The historic wooden ticket office from the old Milton Tennis Centre has been restored back to its former glory and forms part of the entrance at the Brookfield Tennis Complex. Carindale 27 Cadogan Street John Millman Rebound Wall A local Carindale tennis player with unrivalled work ethic and charisma, John did it the hard way to become one of the world's elite tennis players. An accomplished all court player, Jone endured a series of injuries that would end the careers of most. His spirit, dedication and relentless pursuit to fulfil his dream as a professional tennis player would result in hime breaking into the world's Top 40 in 2018. A true gentleman of the game, known for his selflessness and gratitude. Carseldine 20 Medallion Place Pat Rafter Park Pat Rafter Park in Carseldine is 2.07 hectares with long shared pathways, picnic area with barbecues, dog off-leash area and a playground. The park is named in honour of two-time US Open winner and former world number one. Chermside 375 Hamilton Road Evonne Goolagong Rebound Wall, 7th Brigade Park Renowned for her grace and speed around the court, Evonne Goolagong Cawley AO MBE started playing tennis as a young girl by hitting a ball against a wall with a board from an apple crate. The rebound wall is named in honour of this great tennis legend. East Brisbane Access via Hilton Street Hazel Millman Tennis Courts The Hazel Millman Tennis Courts are located alongside Norman Creek. Four courts, leased by the Anglican Church Grammar School are able to hired through Malpass Tennis Coaching. To book the courts, phone 07 3393 0093. Hawthorne 140 Riding Road Fay Toyne Rebound Wall, Hawthorne Park Located within Hawthorne Park, this tennis rebound wall is named after Fay Toyne in recognition of her contribution to tennis as a player and coach in Queensland, Australia and overseas, including playing in nine Wimbledon Championships. 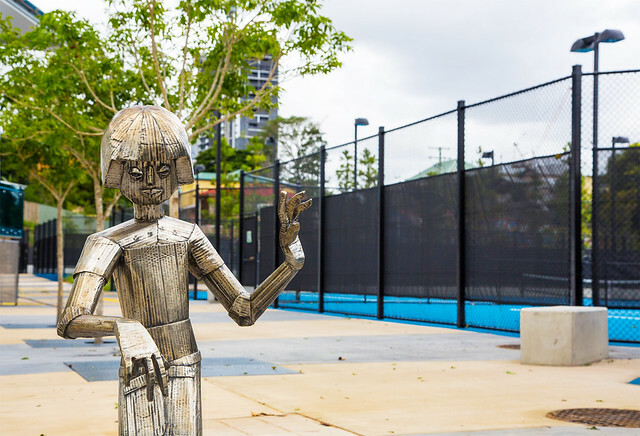 In 2014, Brisbane City Council rejuvenated the former Milton Tennis Centre and Milton Bowl site into 3.5 hectares of inner-city parkland. It was named 'Frew Park' in honour of Mr Robert Dickson Alison Frew, who was the president of the Queensland Lawn Tennis Association from 1910 to 1930, and the driving force behind the creation of the tennis centre. The site features the Roy Emerson Tennis Court, 'The Arena' playground, Wendy Turnbull Green and The Stefan Racquet. Roy Emerson Tennis Centre was named after one of Brisbane's greatest tennis players and includes six tennis courts, a rebound court, amenities and seating with a food and beverage outlet to service park visitors. For centre enquiries and bookings, visit the Emerson Tennis Centre. Alternatively you can find more at the Roy Emerson Museum in his hometown of Blackbutt, Queensland. Wendy Turnbull Green - In June 2014, Council named the large open space in Frew Park, Wendy Turnbull Green, after one of Brisbane's greatest sporting heroines and Queensland Sporting Hall of Fame inductee. Wendy was born and raised in Brisbane and enjoyed success on the Women's Tennis Association Tour as both a singles and doubles player. The Stefan Racquet - In June 2013, the giant tennis racquet, which previously featured at the old Milton Tennis Centre, was re-installed at Frew Park. The seven metre racquet once towered over the tennis centre, but was bought by Brisbane hairdressing entrepreneur, Steve 'Stefan' Ackerie, after the site was demolished. Sheard Deck - A tribute to Sheard Park, which operated alongside the original Frew Park, from 1923 on. Part of the coffee shop on site. Fay Muller Rebound Wall is named after one of Australia's great tennis trailblazers. Ms Muller started her career at Milton in 1948 and made it to the final two of Wimbledon in 1956. She was also the first Queenslander to be chosen to represent Australia in an overseas tennis team in 1955. Morningside 123 Beverley Street Brenda Dale Club House, Morningside Tennis Brenda Dawn Dale (1941-2009) was an Australian ranked tennis champion associated with the Queensland Community Lawn Tennis Association (QCLTA). Brenda Dale has a clubhouse named after her in recognition of her contribution to women's tennis in Queensland. It was Brenda's generosity that supported the QCLTA and funder major refurbishments to the club. For centre enquiries and bookings, view the Morningside Tennis website. New Farm 1042 Brunswick Street Geoff Masters Tennis Courts Amongst one of Brisbane's favourite parks, the New Farm Park tennis courts are named in honour of the Brisbane-born tennis great, Geoff Masters. The courts are managed by the New Farm Neighbourhood Centre. To hire the courts, phone 0422 940 132. South Brisbane Stanley Place John Oxley Library, State Library of Queensland John Oxley Library consists of unique Queensland resources including diaries. manuscripts, artworks, photographs, original maps and plans, and oral histories of Queensland Tennis Greats. The library has a wide range of content chronicling events, people, places and ideas that continue to shape Queensland. 1. The Pat Rafter Arena. Since opening in January 2009, the Queensland Tennis Centre has been the host for combined men and women's international tournament, the Brisbane International. The Pat Rafter Arena is the centre court and was named in honour of the Australian tennis hero, Patrick Rafter. The court has a seating capacity of 5,500. Rod Laver Footbridge - The pedestrian bridge connecting the Yeerongpilly rail station to the tennis centre is named the Rod Laver Footbridge. Ken Fletcher Park is the park in front of the tennis centre and is named after Queensland's larrikin great, Ken Fletcher. Ken is the only tennis player to win the Grand Slam in mixed doubles. The park has a designated site (amphitheatre) available for bookings. A bust of Ken can be found on site. Ken was the subject of Hugh Lunn's widely-read book "The Great Fletch". Daphne Fancutt Amphitheatre - A new amphitheatre named after tennis great, Daphne Fancutt AM, was opened by the Lord Mayor on 11 July 2015. The Amphitheatre is a designated site and is available for bookings. Busts of Rod Laver MBE, Roy Emerson, Mal Anderson MBE(C) and Ashley Cooper AO, as well as extensive player profiles, are a sightseeing must in the stadium. Toowong 55 Mt Coot-tha Road Caskey Monument, Toowong Cemetery Caskey Monument at Toowong Cemetery is a heritage listed site erected in 1902 by the Queensland Government as a tribute to Lieutenant Lachlan Caskey. Lieutenant Caskey lost his life during the Boer War and is buried in South Africa. This unique monument features crossed tennis racquets and cricket bats to acknowledge Lieutenant Caskey's sporting interests. This tennis rebound wall is named after Jimmy Shepherd who is renowned as a champion tennis coach, former coach to John Wayne’s family, and doubles partner of Rod Laver. Jimmy was a pupil of Yeronga State High School, a local boy that made good on the international world stage of Grand Slam tennis.